Opening Reception: November 17, 2015 6-8 p.m. The standard definition of a textile points us to cloth, to the utilitarian, but if we investigate further, one sees that a textile—no matter the construction technique—is essentially a set of elements working together to make a whole. In this sense, textile can be used to describe many things: paintings, drawings, sculptures, and so forth. When initially conceiving of this exhibition, we wanted to highlight the expanded field of contemporary fiber practices, where the influence of the of the textile can be seen in a number of ways, from the structure or aesthetic, to the historical and cultural traditions employed in the works. Craft is embraced as content by some and a production tool for others. In Eric Dever’s three pieces, IBTW 1.15, IBTW 1.21, IBTW 1.34, the carefully assembled squares and rectangles intersect to resemble the warp and weft of weaving. Each painting utilizes a different material—linen, burlap, or traditional cotton canvas—as its backdrop, but is just as important as the paint. Where each shape ends and a new one begins, the material is highlighted in the negative space. 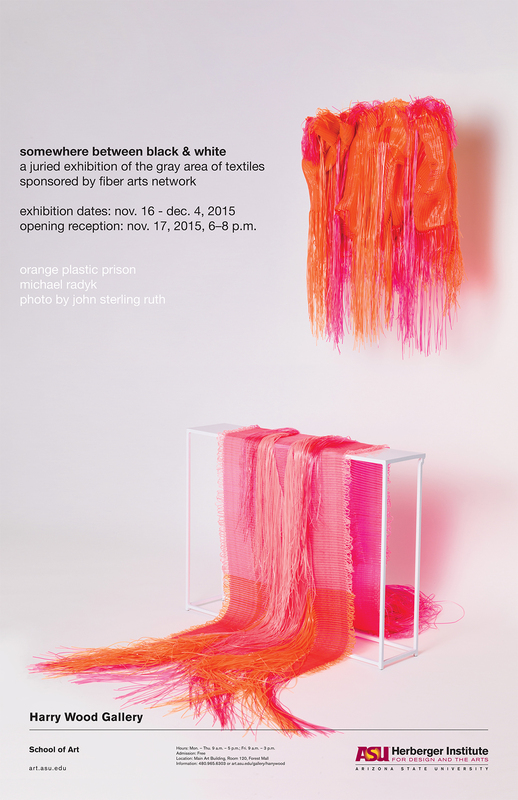 Though traditionally woven, Michael Radyk’s Orange Plastic Prison is far from the usual. Using plastic lace instead of common thread, Radyk challenges one’s perception of textiles. The lace also represents a strand of relatability that is inherent in textiles. While we relate to textiles through clothing and other objects in our daily lives, the plastic lace brings us back to making keychains as children. Jessica Palomo’s graphite marks in Unbounded Growths IV point us to the structure of textiles. Through the intersection of drawn lines, Palomo not only exhibits growth, but also structure. As each mark interacts with each other, we are reminded of the crossing of threads that happens within textiles. Within Somewhere Between Black and White, all of the works have ties to the fiber arts, whether it is the materiality or the methodologies, while proposing new directions and hybrids that represent the interdisciplinary nature of a contemporary craft practice.